Robin and her friend Jess Van Dusen skied in the Duffy Lake area of BC, north of Pemberton. We went to ski Matier, but a road closure epic and conditions didn’t cooperate. 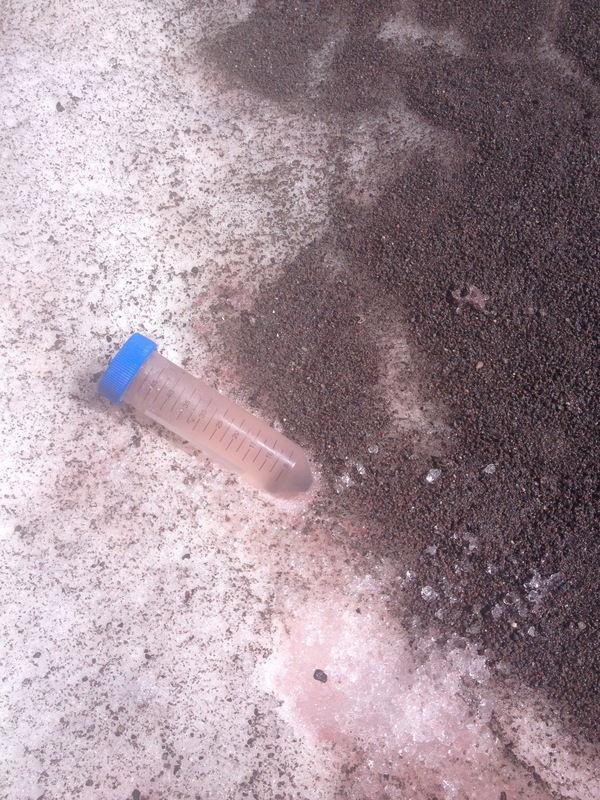 We had a great time in the sunny snow wonderland anyway and got the first snow algae sample of the year! While I spent most of my summer teaching sailing and collecting phytoplankton samples from Bellingham Bay, I took advantage of some time off to head into the mountains in search of snow algae! My first adventure was a Mt. Adams summit on skis. This was my first time climbing Adams and my first summit attempt with skis, and it was a ton of fun. We were a little worried about the heat since it was forecasted to be in the high nineties all weekend, so we started hiking around 3am and were glad to have made that choice when the sun came up. Lots of sunscreen breaks later, we reached the summit and were rewarded with incredible bluebird views and some killer late-season turns. We didn’t see as much snow algae as we had seen on Mt Baker a few weeks ago and only collected a few samples. Still, the trip was a success and we rewarded ourselves with burgers and milkshakes on the way home. The week after that, I headed east to Leavenworth to do some backpacking in the outer Enchantments. I wasn’t expecting to see much snow since our permit wasn’t for the core Enchantments, but a hike up to Windy Pass proved otherwise and I was glad I came prepared with sample kits. I bribed my friends with gummy snacks if they could be the first to find snow algae, a method which proved successful for sample collection but a little rough for my snack stores. Robin is in Chamonix for two weeks to explore the region for sampling sites, and to meet with CREA Mt. Blanc (Mt. Blanc Research Observatory) about global learning programs for students next summer. Today, Robin and her friend Randy went for a hike from town, accessed by gondola. We found some orange snow and pink snow and took a few samples. This is a great way to start! Unfortunately, the weather is stormy and will be all week, so we are not going to be able to get up high on glaciers yet. Sampling site at Lac Cornu. Not pictured: Mt. Blanc and huge glaciated peaks behind those clouds! Many, but not all of those snow patches had algal blooms. Forest teaching some navigation skills. The Kodner Lab was fortunate to participate in a 3-day glacier travel and crevasse rescue training course with Forest McBrian, an accomplished alpinist and guide. Forest had just returned from a 34-day ski tour across the North Cascades and somehow still found the energy to work with us. We are so grateful for his incredible teaching, patience, and for sharing so much knowledge with us. KLab students are now ready to start exploring deeper into the mountain more safely, and Robin learned more about crevasse rescue on skis. This weekend, Robin and Rachael spent some time in the high intensity field site in the Bagley Lakes area near the Mt Baker Ski area. We found many interesting patches of snow algae. Rachael collected her first snow algae samples for her thesis work! Algae class student and Western Outdoor Program trip leader, Emily Muth, collected some samples near Mt Baker and then went and summitted! Here is a photo of her proudly showing her algae samples on the summit. Graduate student Rachael Mallon and I went out to explore the area below Herman Saddle next to the Mt. Baker Ski Area this past weekend, where we will have a high-intensity sampling site this year. We dug a super deep hole (13ft) and probed the bottom and no ground within reach. It is going to be a long snow melt season. I just heard on the radio that we are 125% of our normal snowpack. There may not be snow algae here for while. Sadly, I had a shoulder injury from a bad mountain bike crash in June (that required surgery in September) so I couldn’t climb all summer! I was only able to collect few samples. Upon returning from Peru, where I was teaching a WWU Global learning course with colleague Dr. John All and the American Climber Science Program, I went on a collecting trip with my friend Jenni Minier from Baker Mountain Guides. We hiked up Goat Mountain (steep!) to get a sample from the last little bits of snow we could find in September. We didn’t get a picture of the sampling (which was really challenging scrambling with one arm), but I did get a picture of a very pregnant Jenni hiking down some steep trails on our way home and a picture of our favorite sampling helper, Harvey. Our first sample of 2016 came from Montana! 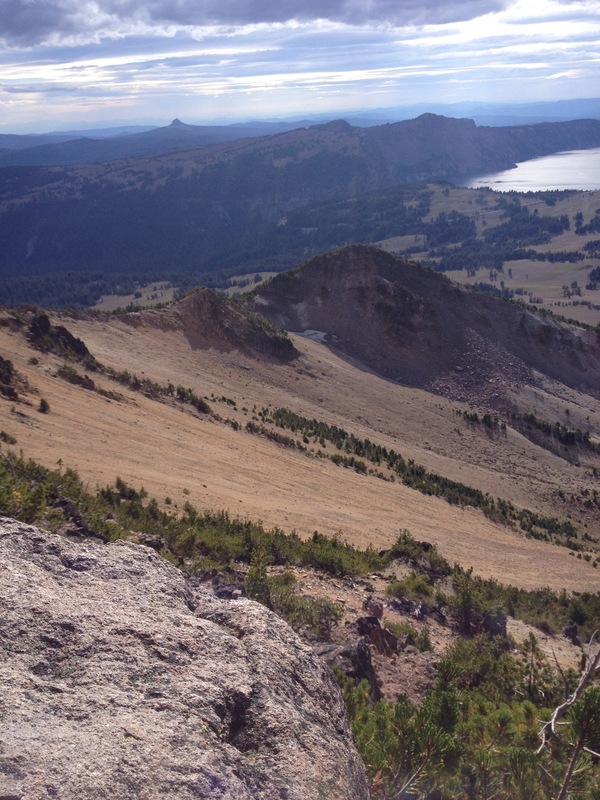 We visited friends near Big Sky and did a popular hike to the Hive and found some snow algae on dwindling snowfields! This summer there was very little snow! It did not snow much Winter 2014/15 and so the snow melted fast. This summer we did have two main initiatives: 1) regular seasonal sampling of Mt. Baker by undergraduate Ciara Assamoto and 2) making a video with our friend Eli Loomis to help spread the word about what snow algae are. Ciara received funding from the Mt. Baker Volcano Research Institute. Here is a picture of me sampling from the Boulder glacier on the trip Eli and I made this video: Studying Snow Algae video. 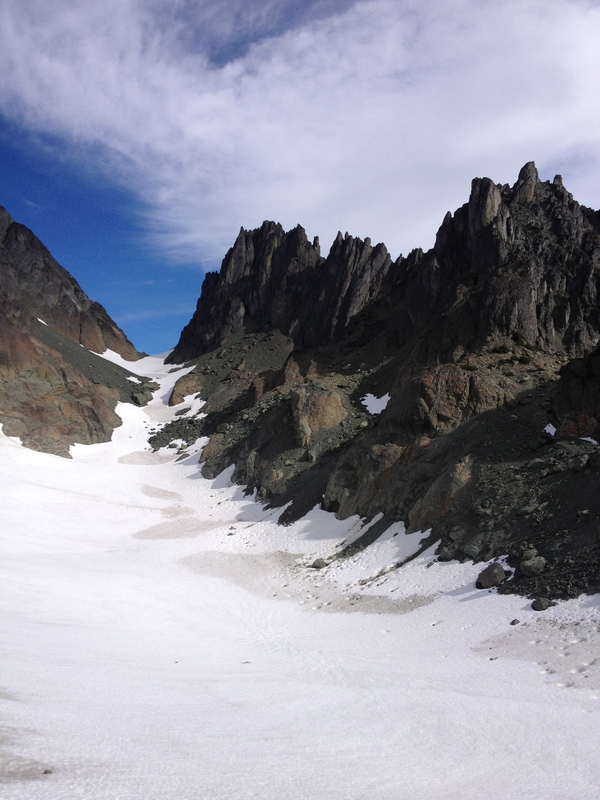 Our first sampling trip was part of the North Cascades National Park BioBlitz snow sampling hike on July 13. 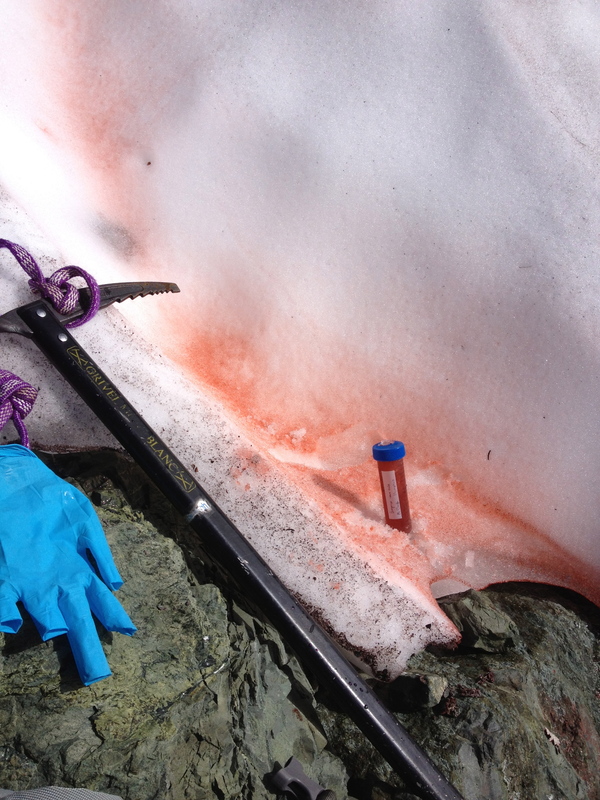 We got some great samples of bright red snow pockets. There were more like snow dimples that actual snow cups. Thanks to my hike co-leaders Sean Schoville (UW-Madison) and John Ribsel (NPS). See News for NPS flier. On a fun and ambitious attempt of the Torment-Forbidden Traverse in a day in mid-August, we were able to take one sample from the snowfield/glacier below Mt Forbidden. We saw pink snow in other places on the north side of the traverse but most of these snowfields were somewhat steep and challenging to access given our time constraints. Thanks to my climbing partners Frankie Devlin and Andy Besabe! Dr. Kodner on decent from Boston Basin. It’s hard to see the pink but we got a good sample. Photo credit: Frankie Devlin. GLACIER PEAK – “White Chuck Glacier” The quotes are because this is not actually a proper glacier anymore. 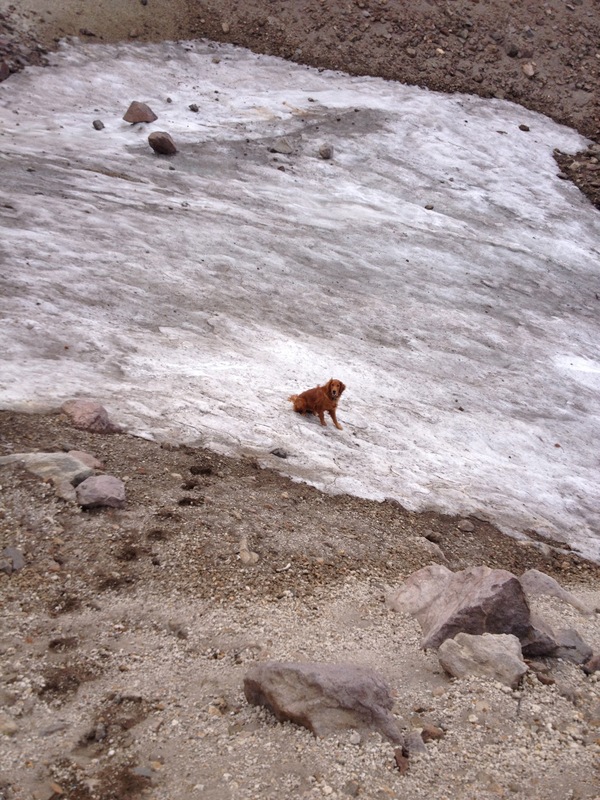 In early September, we went back up to the “White Chuck Glacier” to sample what had been the most dense snow algae blooms we have ever observed – seen in July 2013. We found that the “White Chuck Glacier” area was very dry this September. This is likely because 2013-2014 had a smaller snowpack than 2012-2013, the summer of 2014 has been very warm, and we were sampling two months later in the season. Despite the fact that we didn’t find the amazing algae filled tarns of 2013, we still got some great samples. Thanks to my sampling crew Katy Hancock and Michael Pagel. We sampled broadly across the region this summer from the North Cascades, Olympics, Mt Hood, Crater Lake National Park and Mt Shasta. These were the samples that inspired the whole project! 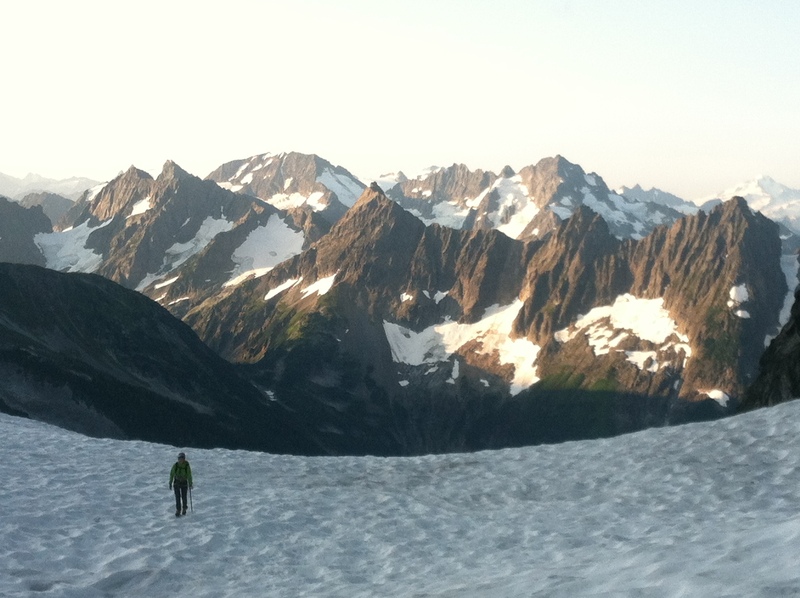 Samples were taken after summiting Glacier Peak on a WCN women’s climbing trip. Thanks to my climbing partners Laura Fan and Paulina Varshavskaya. These samples were taken on a climbing trip (sorta…. we heard the rock in the Olympics is really chossy but come on, this was bad!) in July 2013. Thanks to climbing partner Paulina Varshavskaya. 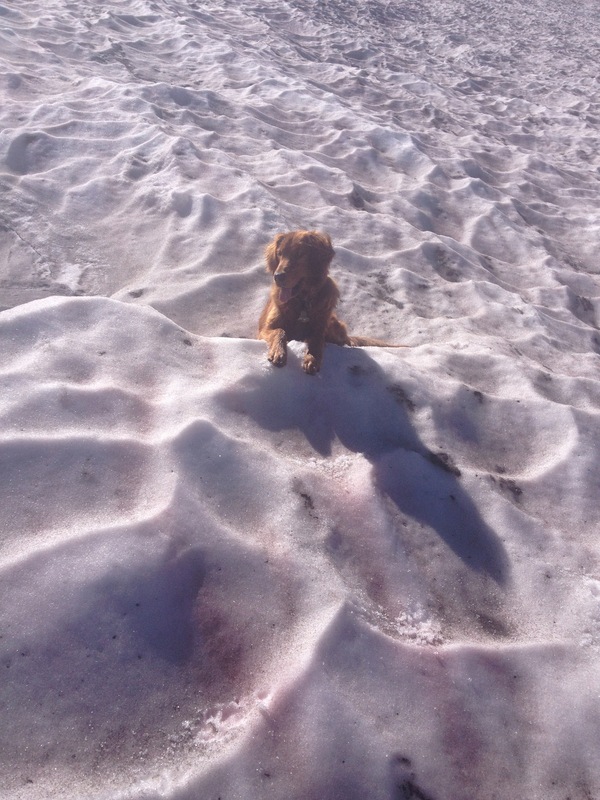 I think Harvey and I found the last remaining snowfield in the park! August 2013. Harvey and I went up on the more remote north side. It was a great hike up to and on the glacier. Even Harvey got into the pictures! Rachael Mallon: Spatiotemporal Diversity of Alpine Snow Algae Communities in the Pacific Northwest Thursday, Feb 28 at 2pm in ES 100. Many of you said you’d like to live stream! I’ll set up a video conference. Please email me at livingsnow@wwu.edu with the email you’d like added to the link! Graduate student Rachael Mallon is preparing to defend her MS thesis in two weeks! Her thesis results are super exciting and we are close to submitting it for publication. If you are in Bellingham, come hear Rachael talk about her work. Stay tuned for details! Mt Raupehu, the largest volcano in NZ and highest point on the North Island. It is a sacred and special place to all who have lived and visited here, past and present. Our northern most site in New Zealand.